At Aquaclear Solutions we’ve invested in the latest window cleaning technology and equipment to ensure all the work we undertake is guaranteed for quality and delivered in a safe and efficient manner. We use purified water to clean your windows which has two distinct advantages. Our portable window cleaning equipment means we can work efficiently and safely without the need for ladder access. This has many advantages for you, the homeowner…. 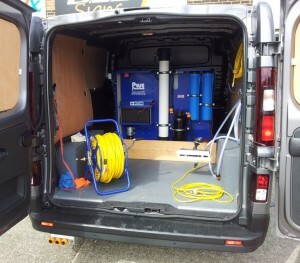 Our specially fitted out van has all the equipment we need to clean your windows. The onboard storage tank means we carry all the water we need which is filtered and has all the impurities removed and held for immediate use. Extendable poles delivered the water to a flexible brush that softly cleans the surface using the pure water. An onboard pump means no loss of pressure and the lightweight design means accurate cleaning and a streak free finish when dry. Hard to reach windows and areas that were previously inaccessible can now be easily reached and the system works equally well for conservatories and orangeries.